We’ve been remiss in picking our favorite Line of the Week, so this week we’re picking three. 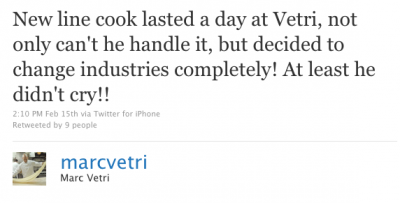 The first, pictured above, comes from chef Marc “You Can’t Handle the Truth!” Vetri’s Twitter feed. As the name implies, the interior is aiming for a knockout, with arches and columns reminiscent of a casino’s interpretation of ancient Rome, beneath a black, industrial ceiling. And finally, in yesterday’s Get Ready for Cook, Coming to Rittenhouse in June post, we have a totally adorable malapropism from commenter Donna. No doubt, Donna’s daughter inspires her mom, but we think she’s probably still aspiring to be a chef. Moms are just the cutest.